I am extremely happy to say that this book has been included in the Reading List of the OCR Level 3 Cambridge Technical Certificate/Diploma Performing Arts, Devising Plays Unit. I was hoping that the book would be useful for those studying Theatre at a young age and to be included in the list makes me think I’ve done something right. To support those of you taking or delivering this unit, I will be adding material to this blog to support the syllabus, including how to obtain and use audience feedback, structuring the drama and developing voice and physicality. For next year, I will release a new edition of Your Handy Companion to Devising and Physical Theatre covering more of the OCR and other exams. Here is the link to the Devising Plays Unit for the OCR Level 3 Cambridge Technical Certificate/Diploma Performing Arts. I am delighted to welcome Montserrat Gili, someone who became a very good friend of mine through working together on quite a few performance and educational projects. Montse has always tackled those difficult projects I could never be part of myself and so, it is without hesitation that I am giving her this space to tell you about her latest venture. I am a theatre practitioner and I have been leading workshops for many years in many different settings, including working with NEET young people (at risk of exclusion), young people with autism, etc so I KNOW how participating in the arts can help a young person… To improve their confidence, their empathy, their relationship with themselves and others, their leadership skills, etc, etc. What I do want to talk to you about is a project that is different because as well as all the above, it can also help young children who live in the streets to find other options and eventually leave the streets. This project will take place in Zambia, where there is a charity called Barefeet which works with children at risk of becoming disengaged from their communities. Barefeet helps children who are living on the streets or at risk of becoming street children to transform their lives. Those former street children are now professional performers at Barefeet and are a shining example of how arts can change your life. 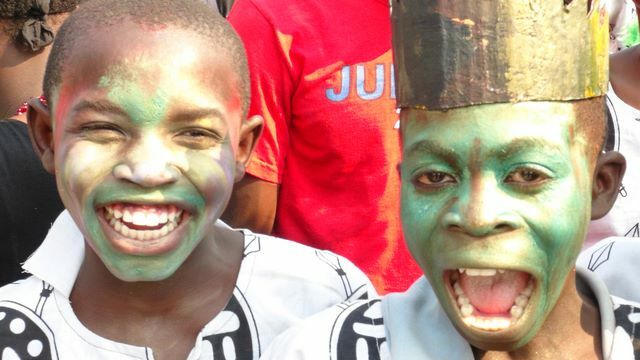 The Christmas show is a recurring event that brings a bit of magic to the Christmas of street children in Lusaka. Not only do we give them a spectacular show and a present from Santa, we also bring them into contact with different orphanages and former street children. Those former street children are now professional performers at Barefeet and are a shining example of how arts can change your life. I will be going to Zambia at the beginning of November to direct a Christmas theatre show for street kids. For most of them it will be their first experience with live theatre, but they will also have the opportunity to take part in workshops with the performers, they will receive a little gift, food and they will be put in touch with organisations that can give them options to leave the streets. So as I said, a worthy project, but of course, we are still raising funds to help this happen. Please help us in any way you can, even if you can’t give at the moment, please help us by passing this along to your network of friends, family or colleagues. The more distribution the better, especially since we don’t have that much time to raise the funds.